No. Gas that occurs in water wells is usually from natural pockets of methane gas associated with shallow aquifers. In most cases, methane gas originates either from biological activity such as plant decay or from shallow coal seams. Such gas is often found in areas with no oil and gas activity. Methane or CH4 from shallow coal seams or decaying organic matter at shallow depths can seep into water wells and then is piped into the home through the waterline. This uncommon phenomenon has been documented in parts of Canada for several decades including areas with no oil and gas activity. There have been rare cases where gas from oil and gas production has escaped into fresh water aquifers; however, improper well construction was determined to be the cause, not fracking. Pre-drilling and post-fracking water well testing is utilized to ensure that gas from nearby producing wells does not migrate into well water. Natural gas is a mixture of methane, ethane, propane, etc. and each zone’s gas has a unique “finger print”. If there is gas suspected within a water well, samples can be easily tested and compared to see if it matches those found in the zone that produces it. The segment from the movie “Gasland” shows an individual that lights a flowing kitchen faucet on fire. The homes shown in the film were located in Colorado. The Colorado regulator released a statement dispelling the myths of this film. They concluded that the water in these homes contained naturally occurring methane from bacterial activity and buried organic material and “was not related to oil and gas activity”. Flammable methane can be released by decaying organic matter at the bottom of lakes or rivers. 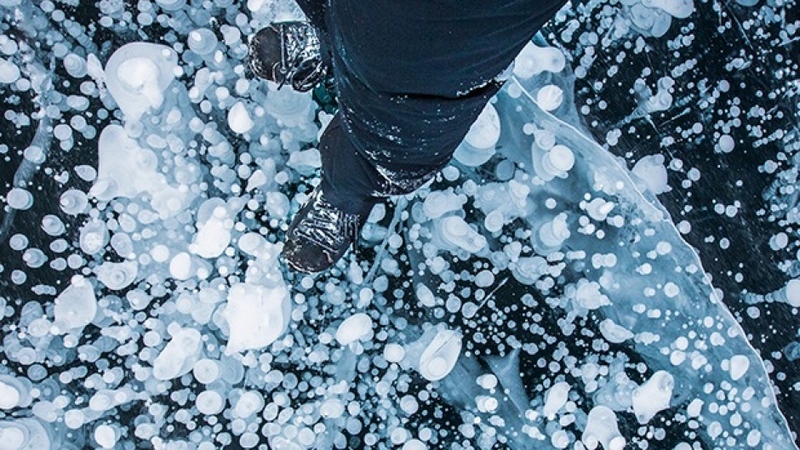 In this image, the frozen bubbles are created by flammable methane gas in Banff Lake, Alberta. (photo credit: Paul Zizka) If the temperature gets low enough, the bubbles from naturally occurring methane freezes — making for some amazing photographs. In Canada, each wellbore is constructed so that layers of steel casing and cement prevent fluids from migrating from the well into fresh groundwater. In addition, the actual fracking occurs at least 1 kilometre deeper than fresh groundwater. As a result, the risk of contamination during fracking is very low.